Note: For those of you who signed up to get notified of each response (by checking the “Notify me of follow-up comments” box in the “Add Comments” section) and find it’s generating too much email, you can unsubscribe to the “Whatsitwednesday” comments by clicking the “unsubscribe” link in the “Whatsitwednesday” email you receive. A Kris’s Kross knife sharpener. RAZOR BLADE SHARPENER STROPPER KRISS KROSS, as previously mentioned. I think you look at incorrect picture. Is not flexible metal pin holder for flowers. Explain, please, why a crank? Maybe to grind the flowers to a sharp edge. With all respect, that is NOT "a flexible metal pin holder for flowers". You must have posted the wrong photo. Please correct this! We inadvertently posted the wrong answer. Most of you were correct. 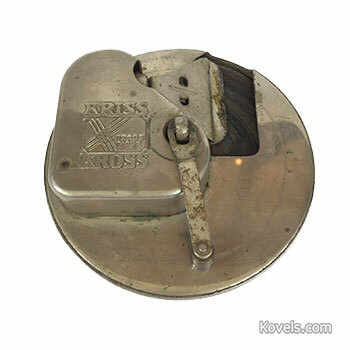 It’s a Kriss-Kross knife sharpener by Rhodes MFG Co. Patented- June 30, 1921. Is it some kind of animal trap? This is a razor blade sharpener from around WWII. I have one just like it. Don't know what to do with it. Could it be a locking mechanism. That attachment bar is ?? Kovels.com is pleased to share your comments. Your postings may be reprinted elsewhere on the site or in our print publications. We encourage a variety of opinions, but ask that you refrain from profanity and hate speech. To post comments, you must be a registered user of Kovels.com. Please remember that your username will appear with any comments you post.